this will be one of the easiest recipes you've ever made. 1. Any flat candy bar will do...I have been thinking about trying the Hershey's Cookies and Cream bar. 2. 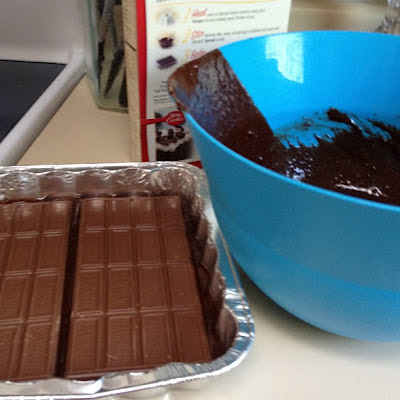 These usually take about 10 minutes longer to bake than normal brownies. I check them until a toothpick comes out clean. 3. I stole this recipe from my friend Hillie...she calls them crack brownies because they are SO good you can't stop eating them. I know Joy made them recently and was not disappointed! Have a great holiday weekend, friends!! Wow. I think I will run all weekend in preperation for these bad boys. YUM! OMG I have to try these! I haven't thought about Symphony bars in FOREVER! Looks so yummy! Oh my Lord!!! I've got to make these! Oh boy I think a few times aroundthe block will be necessary. I think Kit Kats would be an unexpected twist, might have to try! Holy heck!! These are gonna be some serious crack rock in my life!! Watch out! ;) Thanks for sharing! Those looked amazing on instagram- thanks for sharing! Happy weekend!